Ron and Carla Heirs made news headlines and viral fame with their public overdose last year. They were found lying on a sidewalk, sprawled out in different manners while overdosed on Heroin. Bystanders took to their phones and livestreamed the incident to Facebook, and it was viewed and shared over hundreds of thousands of times. One year later they are sober, and speaking about their humiliating experience. They had just picked up heroine and used in the nearby Walgreen’s bathroom. Ron says Carla rushed him to use before they returned to their home, and he complied. He injected her with most of the purchase, and then he used the rest. Then he added his monthly prescription of Xanex pills, almost 4 dozen in total. After using they headed towards the bus stop, and that’s where they passed out. The stop was near the medical district, near a major academic hospital. People on their way to appointments, class and work were witness to their distress. A bizarre scene, in broad daylight, where people just walked by. Those that chose to bring out their phones to put the spectacle online harassed and even made up impromptu raps about the couple, one slumped backwards over a small bench, and the other inches from the curb, face down, unable to pick herself up. They were transported to a nearby hospital and given Naloxen, the powerful anti-overdose drug that firemen, paramedics and even police have now started to carry for this sweeping epidemic. Ron was released and made his way home. Carla was arrested for a petty theft warrant and served 30 days in jail. 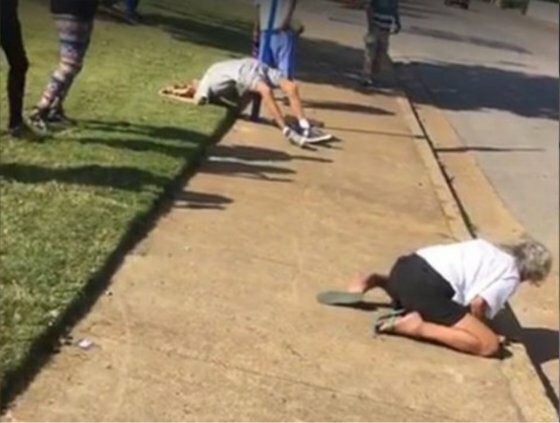 At the time, they were completely unaware that their mortification was publicly displayed on Memphis’ local news, and more widespread, on Facebook, being shared and commented on by hundreds of thousands of strangers. Paris spoke to a dispatcher for the hotline who connected her to Stacey Dodd, the director of operations for a facility in Tennessee. Dodd himself a recovering addict, saw an opportunity to help Ron. He offered to bring Ron in for a 30-day treatment program and waive the typical fee, which can run up to $25,000. Once Ron woke up on the first morning in the center, he wanted to leave. He looked for an exit but once he saw that the facility treated patients in a Co-Ed setting, he changed his mind. After completing the first 30 days of the program, Paris called her father and begged him to stay in longer. 30 Days couldn’t erase 48 years of addiction, Paris said, and her father agreed to stay in treatment for longer. The recovery center Ron was staying at, like many other co-ed treatment centers around the country, relies on a combination of medications and behavioral therapy to help users overcome their addiction. Medication assisted treatment involves using another opioid, like buprenorphine, to withdraw gradually from the dependence of the drugs. Physicians can prescribe buprenorphine without the need of a rigid clinical program to monitor the recovering addict. It’s less likely to trigger the addictions reward cycles that morphine and opioids do. It’s use does not come without controversy, and law enforcement officers say its just replacing one drug for another. After a few weeks, Carla reached out to Paris to find out what had happened to Ron. Paris told her that Ron was in a treatment center, and she urged Carla to contact the number she had and tell them who she was. When she did she was offered a similar treatment plan, but at a facility in Massachusetts. The center thought it would be best if Carla was placed at a different facility, since Ron and Carla had used for so long together. They met at a drug dealers house who was throwing a party, and that was the meeting that lead to their 20+ year marriage. Carla was then put on a plane and flew 1300 miles away from her familiar surroundings. She flew to another Co-Ed Facility to take on sobriety on her own. “I had to relearn my thinking, I had to relearn my dealings with people and to listen to people,” She says of entering treatment. She’s now on her own, in an apartment in Massachusetts miles away from her past life. She grew up as a southern Baptist, and she began to rediscover her faith and commit to a new life. Her daily routines are meetings, and sharing her story of recovery with those also looking for a clean life. “I don’t want to go back to Memphis. A lot of bad memories, a lot of bad things happened there,” she says. Carla and Ron have not seen each other since the overdose, but speak frequently through social media or over the phone. After concluding that they were bound together by drug use and crime, they are missing their link and have realized they are different people.